Kevin Trenberth and the UNIPCC have enthusiastically promoted the notion of impending climate disaster. But when Kevin Trenberth admits to colleagues that he can’t explain what is going on, we should thank him for his candor, put aside the message, defer planned legislation, cancel attendance at international meetings and take a good hard look at the possible causes of climate change. The ‘Anthropogenic Global Warming’ mechanism is plainly in trouble. What else is at hand? Trends in tropical and global temperature are dictated by change in the electromagnetic forces governing the distribution of the atmosphere. The atmosphere can shift from high to low latitudes or vice versa over any time interval. Atmospheric pressure governs the strength of polar vortex activity. Vortex activity determines the flow of nitrous oxides from the mesosphere that govern the concentration of ozone and therefore the temperature of the upper atmosphere. When the temperature of the upper atmosphere changes, so does the concentration of reflective ice crystals, so changing the porosity of the atmospheric filter that determines how much sunlight reaches the surface. Change in the distribution of the atmosphere is continuous. Such a change initiated the celebrated climate shift of 1978 that was followed by thirty years of warming. But a mini-shift occurs once or twice each year, whenever the polar atmosphere warms in the middle of the polar night. Regardless of the time scale, the result is the same. The warming of the polar stratosphere initiates a period when more sunlight gets through the atmospheric medium to warm the surface of the planet. A low pressure regime at the pole weakens the polar vortex. A high pressure regime strengthens the vortex. If the vortex weakens, ozone levels increase and the air warms. This is a direct consequence of a slower flow of nitrous oxides from the mesosphere. These compounds are hungry for oxygen. The ozone content of the upper atmosphere determines its temperature. Ozone absorbs UVB from the sun and Infrared from the Earth. The stratosphere represents the temperature inversion to top all temperature inversions. This is a classic greenhouse gas warming scenario. But the mechanism whereby temperature increases aloft to cause temperature to increase below has nothing to do with back radiation. That simply doesn’t work against the countervailing force of convection. No, it’s to do with ice cloud. Ice cloud density changes when the temperature of the upper atmosphere changes. This is very likely the factor that modulates the flow of solar radiation to the surface of the earth. Manifestly, surface temperature closely follows that of the upper atmosphere as is clearly evident in figure 1. We don’t have to know how it works to appreciate the dependence of surface temperature on the temperature of the upper atmosphere. We jump in the car, move the lever to ‘first gear’, let out the ‘clutch’ and off we go. Indeed, it’s a big surprise when it doesn’t happen that way. Driving a motor car is an act of faith. We can understand the climate system and predict the near future on the basis of the linkages described above . Inspecting figure 1, we can see that, patently, 200hpa temperature (about 10km in elevation) varies much more than surface temperature. About 1978 the temperature of the air at 200hpa stepped up to a new plateau in the space of just a few years. Since that time, 200hpa temperature has been in slow decline while sea surface temperature has continued to exceed the period mean. It hasn’t risen much but nor has it fallen by very much. Short term variation in surface temperature is a much dampened version of temperature gyrations in the upper atmosphere with change initiated from above rather than below. Change in the temperature of the upper atmosphere leads the surface. The ice cloud region stretches from a few kilometers to 20 or more in altitude. It is therefore far more extensive and it seems, more influential, than the near Earth cloud zone that is composed of water droplets. Unlike water droplets, microscopic ice crystals are near invisible and very hard to detect from satellites or from the surface. 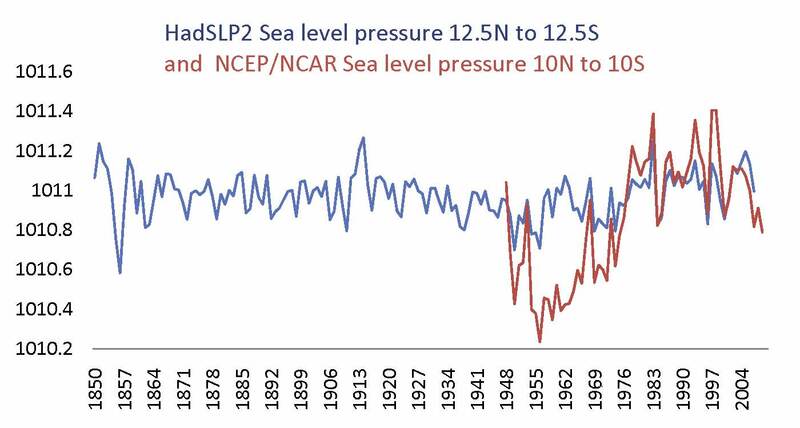 But the evidence of changing sea surface temperature tells us what we need to know. When air pressure drops at the pole it increases at low latitudes. Figure 2 shows that there is a strong relationship between surface pressure at the equator and sea surface temperature. Pressure is plainly the independent, more volatile, variable and there is frequently a short lag in the temperature response. The climate shift of 1978 that initiated strong warming is apparent in both series. The cooling process that set in after 1998 is plainly associated with declining atmospheric pressure at the equator. 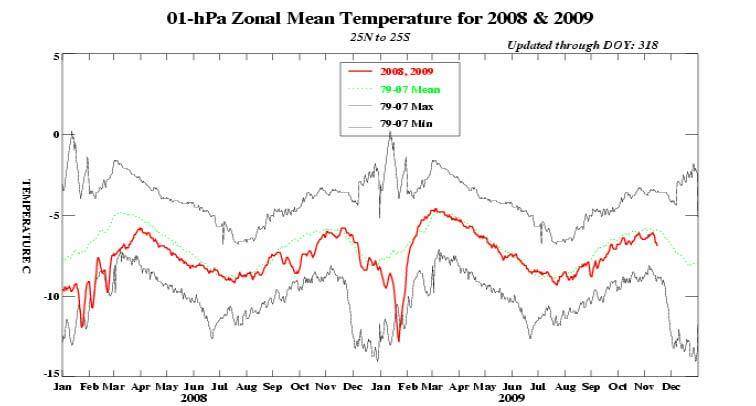 A major stratospheric warming in the Arctic in January-February 2009, as seen in figure 3, is associated with a simultaneous fall in the temperature of the tropical (25N to 25S) stratosphere, as seen in figure 5. 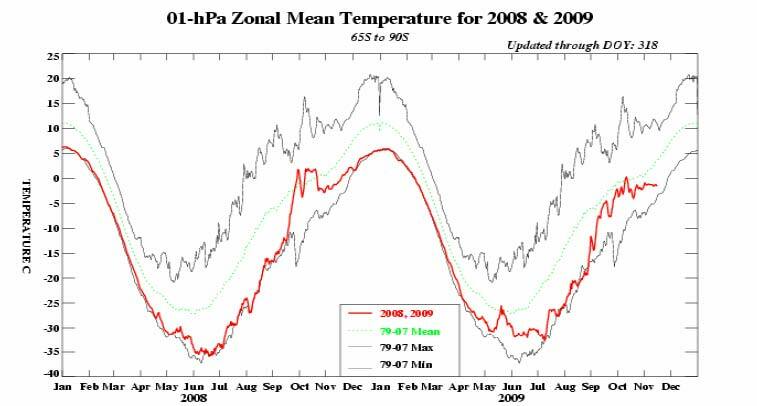 I suggest that the fall in the temperature of the tropical stratosphere is associated with the outward movement of the zone of direct heating of the atmosphere by incoming short wave radiation as atmospheric pressure rises at the equator. A sudden stratospheric warming at the winter pole influences month to month weather elsewhere because it is related to an increase in ozone content. 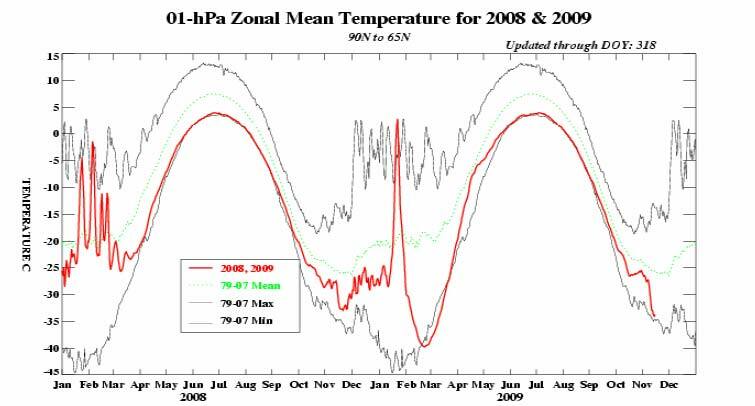 See figures 7-14 at https://climatechange1.wordpress.com/2009/03/08/the-atmosphere-dancing-in-the-solar-wind-el-nino-shows-his-face/, where the increase in ozone is carefully documented. Episodic sudden stratospheric warming does not change climate. It is the change in the distribution of the atmosphere that persists over longer time periods that changes the climate. 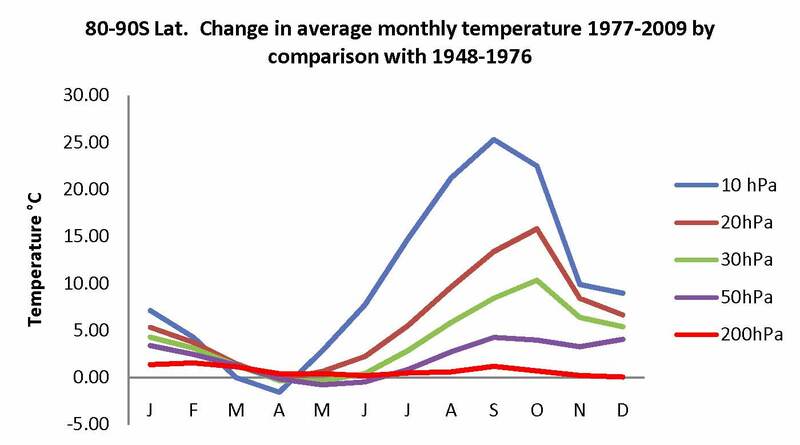 Figure 3 shows that after 1979, the Arctic stratosphere has shown marked variability in temperature between October and April (black lines). While the lower bounds of the temperature curve show a positive anomaly in December and January this curve is otherwise about where we would expect it to be. It is dictated by the tilt of the Earths axis and its rotation about the sun. However, the upper boundary of the thermal range shows marked anomalous warming between November and March including a dramatic increase in December. This is in the middle of the polar night. Figure 4 shows evidence of enhanced variability in the temperature of the southern vortex between April and February with peak anomalies centered in August and September (black lines). By contrast, the range is very restricted in the late summer and autumn months February, March and April. Figure 5 shows that cooling of the tropical stratosphere occurs between November and March with the most intense cooling in November and December. The Earth is closest to the sun in January and this is when temperature at 1hPa should be warmest. 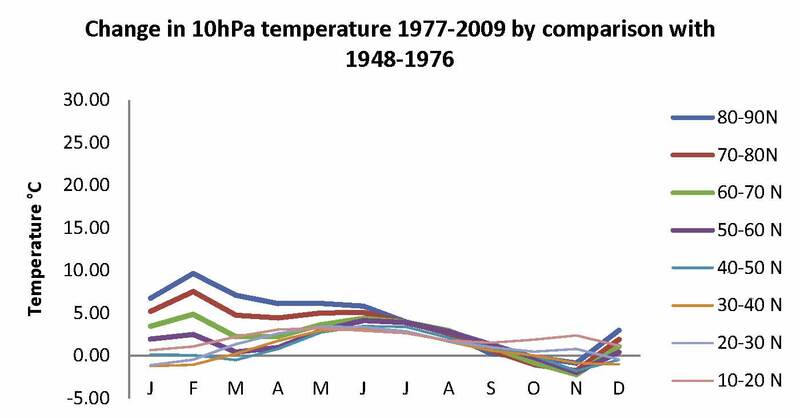 A decline in temperature at 1hpa between November and March is anachronistic. It can only be due to a shift in the atmosphere. My last post ‘The climate Engine’ showed that the difference between the pre 1978 cooling mode and the post 1978 warming mode was a marked increase in the temperature of the stratosphere peaking in September in Antarctica and February in the Arctic. See figures 6 and 7 as re-numbered for this post. How do I reconcile the fact that the evidence in figure 5 suggests that the peak period for the gain in atmospheric pressure in the tropics lies, not in September or February, but midway between the two in November and December. Naturally, if the poles are suffering a simultaneous depletion, as they do when surface pressure drops simultaneously at both poles the atmosphere can pile up only in the tropics. There is nowhere else for it to go. The upshot of this analysis is that shifts in the atmosphere are responsible for an increase in the temperature of the upper atmosphere with peak warming occurring between August and February. This feeds through to sea surface temperature. The southern hemisphere experiences a warmer spring and summer in consequence. The vast expanse of the southern ocean absorbs the energy. In the cooling scenario it is the southern oceans that suffer a depletion in energy supply. That is simply a function of the time of year when the polar stratosphere warms. This is consistent with earlier bud burst and ripening in grapevines in the last forty years. Its a plant that leafs out in spring and matures its fruit in Autumn. The ENSO phenomenon is intimately related to atmospheric shifts. Figure 8 shows the relationship between the Southern Oscillation Index and sea surface pressure in the Indonesian region. In figure 8 the SOI index is inverted by changing its sign. Warming is indicated by a rising index which is more intuitive. Plainly, there is a very close association between the SOI and pressure over Indonesia. 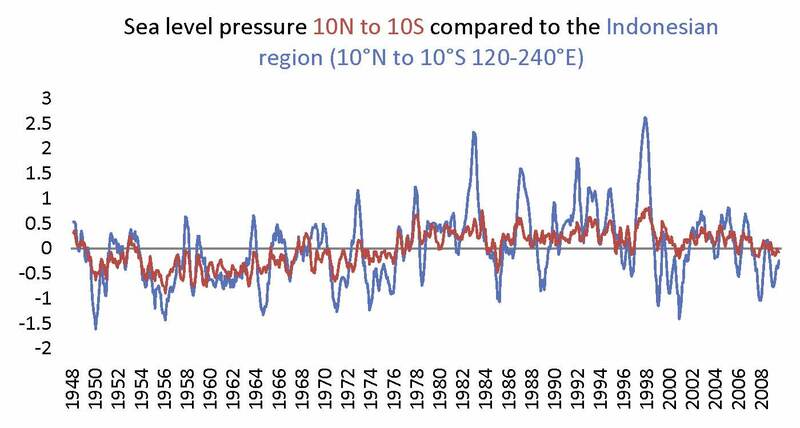 The SOI index is based on the relationship between atmospheric pressure in Tahiti and Darwin. A falling SOI is accompanied by a slackening of the Trade winds and rising sea surface temperature at the equator while a rising SOI is accompanied by intensification of the trades and a cooling sea. The Southern oscillation Index, and change in the Nino 3.4 region in mid Pacific are monitored because change in this region is associated with changing climate phenomena world-wide. 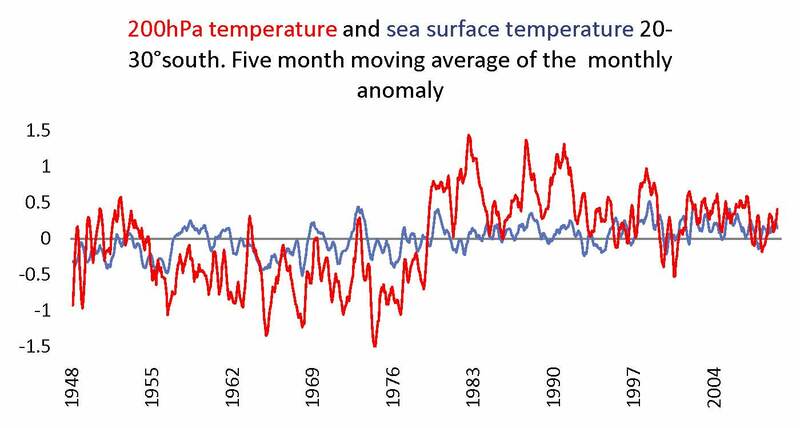 Global temperature follows tropical sea surface temperature with a lag of a few months. Billions of dollars of research funds have been dedicated to studying temperature change in the Pacific Ocean. In spite of this investment, the dynamics of atmospheric change that drive the change in the temperature of the sea remain unknown, mysterious and controversial. Some birds, when faced with a threat to their existence will bury their head in the sand. Anthropogenic Global Warming theorists are not immune. It is patently obvious that the El Nino Southern Oscillation phenomenon (ENSO) is the manifestation of ‘climate change in action’ both in the short and the long term. However, this interpretation is very much at odds with the version of climate science expressed by the U.N.I.P.C.C. where it is assumed that ENSO is internally generated and temperature neutral. Nothing could be further from the truth. This organization prefers its own highly speculative view of climate change in preference to that which is observed. This apparently ‘orthodox view’ is mistaken. Like many other supposed ‘pollutants’, carbon dioxide is just ‘plant food’. Like many other plant foods, it is in short supply. Many farmers who work with controlled atmospheres purchase carbon dioxide to supplement the natural supply. The atmosphere and the UNIPCC, ‘climate models’, have very little in common. Kevin Trenberth has implicitly admitted this. Figure 9 shows the relationship between surface pressure in Indonesian waters and the global tropics as represented by the latitude band 10N to 10S. It is apparent that pressure in Indonesia is an amplified version of pressure in the entire tropics, perhaps reflecting the movement in the zone of convection across the Indo-Pacific oceans. The dramatic change in surface pressure in the El Nino of 1997-8 establishes this as the most powerful El Nino event of the last half of the century with the event of 1982-3 second in apparent intensity. From 1978 to the present time, surface pressure at the equator has been greater than the period average whereas prior to 1978 it was less than the period average. The globe cooled in the nineteen seventies, warmed between 1978 and 1998 and has since cooled. Periods of cooling are denied in ‘U.N.I.P.C.C.’ climate science. It appears that data is massaged to remove them. That is not science. It’s spin. In problem solving activity, science can be of no utility unless some ground rules are adhered to. One must call a spade, a spade and cooling is cooling. Since tropical sea surface atmospheric pressure is such a good guide to surface temperature it occurred to me to extend the data series as far as possible into the past. The virtue of barometric pressure is that it is not subject to urbanization effects, changes in land use and does not suffer from discontinuities due to relocation of the recording site, all problems that bedevil the temperature record. Evangelista Torricelli, working with Galileo, became the first scientist to create a sustained vacuum and to discover the principle of a barometer. Torricelli realized that the variation of the height of the mercury from day to day was caused by changes in the atmospheric pressure. Torricelli built the first mercury barometer around 1644. In 1843, the French scientist Lucien Vidie invented the aneroid barometer and this was soon linked to a recording device. 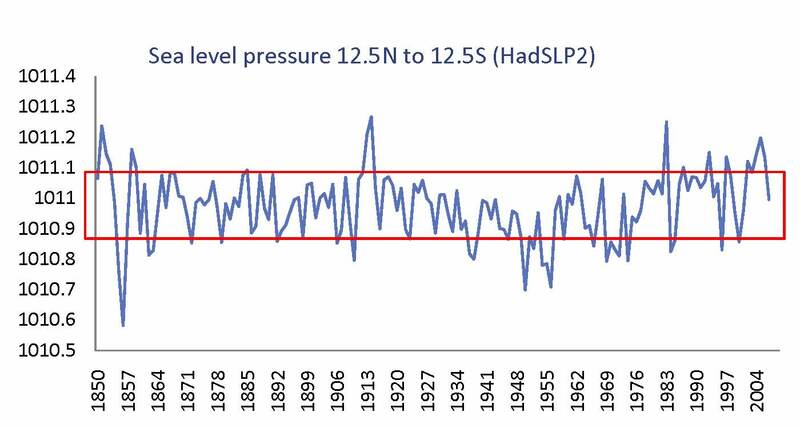 Surprise, surprise, the period from 1922 through to 1978 is characterized by low barometric pressure in the tropics whereas the period after 1978 is characterized by very high barometric pressure. In this graph we see the origins of the global cooling scare of the seventies and the warming scare of recent times. It would be a brave man who could suggest that the increase in barometric pressure post 1978 is in any sense unusual. Recent change in global temperature is explicable in terms of atmospheric dynamics that depend upon the influence of the sun. There is no need to invoke an anthropogenic influence. There have been episodes of very high barometric pressure in the past, just as extreme as those of recent years. One can confidently assert that the pressure record is an accurate reflection of thermal conditions and is probably better than the temperature record itself. The period since 1978 is therefore warm only in the context of the cool period that immediately preceded it. Good science requires accurate measurement and careful extrapolation where no data is available. In that context consider the difference between HadAT2 and NCEP /NCAR Reanalysis versions of atmospheric pressure near the equator as represented in figure 11. Do these two series reflect national differences in demeanor? Is British ‘reserve’ and American ‘exuberance’ coming through? Where oh where does reality lie? Are scientists kidding us when they maintain that they have a handle on measurement? When they say they have confidence one way or the other, do they really expect us to believe them? When I was just a lad my mother read me the story ‘The Boy Who Cried Wolf”. I guess we are just coming to terms with the refinement of what is conveyed by the term ‘Expert’ and the term ‘Scientist’. But, to be humane about it, all so called ‘knowledge’ is speculation anyway. We ‘choose’ what to believe on the basis of very limited evidence and most of the time it doesn’t worry us at all. NCEP/NCAR data is described in Kalnay, E. and Coauthors, 1996: The NCEP/NCAR Reanalysis 40-year Project. Bull. Amer. Meteor. Soc., 77, 437-471. This reanalysis was the first of it’s kind. NCEP used the same climate model that were initialized with a wide variety of weather observations: ships, planes, RAOBS, station data, satellite observations and many more. By using the same model, scientists can examine climate/weather statistics and dynamic processes without the complication that model changes can cause. The dataset is kept current using near real-time observatons. Global warming has stopped and human caused global warming never was. The research presented in the October 14 pdf at http://climaterealists.com/index.php?tid=145&linkbox=true provides a model that accurately calculates all average global temperatures since 1895 with no consideration whatsoever of changes to the level of CO2 or any other ghg. All unknowns in the model can be determined by just using data prior to about 1975. 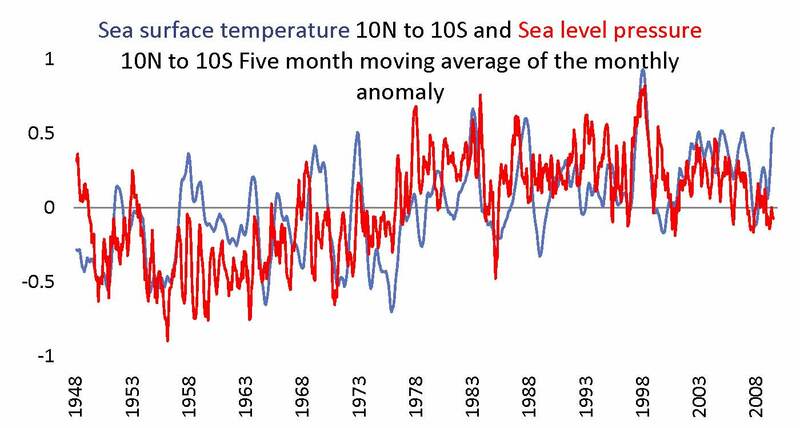 The model accurately predicts average global temperatures since then. Since 2000 the atmospheric carbon dioxide level has increased 18.8% of the increase from 1800 to 2000. According to the average of the five reporting agencies, the average global temperature has not changed much for several years and during the seven years from 2002 through 2008 the trend shows a DECREASE of 1.8°C/century. This SEPARATION between the increasing carbon dioxide level and not-increasing average global temperature is outside of the ‘limits’ of all of the predictions of the IPCC and ‘consensus’ of Climate Scientists. The separation has been increasing at an average rate of about 2% per year since 2000. It corroborates the lack of connection between atmospheric carbon dioxide increase and average global temperature. As the atmospheric carbon dioxide level continues to increase and the average global temperature doesn’t it is becoming more and more apparent that the IPCC and many Climate Scientists have made an egregious mistake and a whole lot of people have been misled. When you see “smoke stacks” on Television to boost the argument of man-made climate change, you have to be a dummy to see that most all the “stacks” spewing out white stuff, are actually spewing out steam, which, for those who quit thinking, is moisture. Now, moisture in the atmosphere is, by far, a bigger heat-sealing blanket than plant food, but its is a useful ingredient just like plant food. It would appear, the promoters of man-made climate change are simply trying to fool the many so they can walk off with the control they seek, and the money. I share your concerns. But I don’t think the proponents of AGW will be moved by contrary observation at all. The whole thing has nothing to do with observation and a lot to do with belief. I would like to thank you for posting your work on a website. Your site and Bob Tisdale’s are 2 of the most interesting I have found and actually make me exercise what brain I have. And I thank you for taking the trouble to comment. End of the day its about the communication of useful ideas. Good logical stuff – and although I’m no climate scientist it makes a pleasant change to the bull that’s been thrust down everyone’s throats about “carbon pollution”! I have just completed helping an author in Geelong to rewrite his book abouit magnetism, gravity, the atomic theory, and the effects of these things in determining our weather patterns, including cloud height variations. On the other hand we’ve had various ‘scientists’ and ‘experts’ and economists all on a wonderful gravy train to creat a scare based on computer models that cannot predict the past, let alone the future! At least the ‘cat is out of the bag’ now! Erl, another very compelling post, thank you. Could you comment on the ‘ozone hole’ it’s duration and extent, and surface effects. Next post I am going to look at trends in temperature and pressure to document an increase in the strength of the polar vortex since 1978. As the vortex strengthens ozone levels fall as does the temperature of the upper troposphere. The above shows the connection between the northern vortex and the Arctic Oscillation. witht the proliferation of postings around the webb of apparently reasonable dissections of the temperature record, do you have an opinion of how a say .3-.5 hot bias in the record would change your ideas, if at all?? A warm bias would not be at all surprising. I don’t have confidence in our ability to accurately measure temperature in all locations. There is also the problem of characterizing change in terms of a single number. Surface temperature changes much less in the tropics than atmospheric temperature at 850hPa where latent heat is released. So, surface temperature is not a good guide anyway. So, I see the effort to come up with a single figure as the result of people pushing barrows and wanting to get simple stories in front of the public. But my efforts are directed at working out how and where the temperature changes so we can understand the system. I have no doubt that the temperature does change and it does so quite unequally from place to place as dictated by the flux in cloud. It is good to see you are still researching the natural climate factors. I have been staying away from causes because without the historical records being fixed we can only guess what is happening. It appears that the public at large is gradually getting the message. The climate system is not as simple as some would have us believe. Environmentalism is just another dangerous ism that would lead us down the garden path to an Orwellian world of control by an elite who see themselves as the high priests of the present and the future. I reckon I have said my piece based on a study of about 30 years of good data and thirty years of somewhat speculative data prior to that.